Folks might have noticed the dark-haired woman in the center of a historic photo of Franklin D. Roosevelt signing the bill that created Social Security. We ran it in Friday’s paper, accompanying a story about the 80th anniversary of the federal safety net program. The woman, of course, is the late Frances Perkins, the U.S. secretary of labor from 1933 to 1945 and a resident of Newcastle. As labor secretary, Perkins was largely credited with creating FDR’s New Deal and multiple programs to protect U.S. workers. A party honoring Perkins, who died in 1965, and her contributions was held Friday at the Frances Perkins Center in Damariscotta, the eighth annual celebration of her legacy. When FDR asked Perkins to become labor secretary, she already had an impressive resumé, having risen to labor commissioner in New York. She famously challenged President Herbert Hoover in 1930, stating flatly that the country was not recovering from the Depression and that job losses were continuing. The rebuke put her on the front page of newspapers across the country. He agreed. Eight-two years later, nearly all those policies have become the law of the land (and depending on how you feel about the Affordable Care Act, you could argue they all have). For more on the life of Frances Perkins, check out francesperkinscenter.org. Here’s an odd trend: Some countries are offering citizenship to rich foreigners who buy homes within their borders. Malta, the Bahamas and cities within Brazil are all clamoring to attract ultra high-net-worth individuals (generally defined as people with more than $30 million in assets) to buy homes. The trend was detailed in a report by Wealth-X, a global market research firm that focuses on information about the affluent, commissioned by Sotheby’s International, a real estate company that caters to the high-end customer. 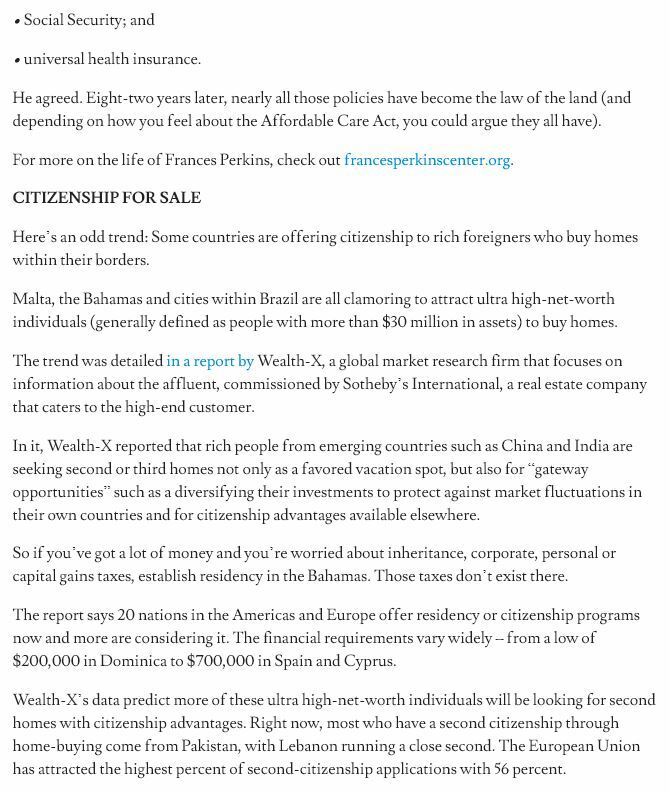 In it, Wealth-X reported that rich people from emerging countries such as China and India are seeking second or third homes not only as a favored vacation spot, but also for “gateway opportunities” such as a diversifying their investments to protect against market fluctuations in their own countries and for citizenship advantages available elsewhere. So if you’ve got a lot of money and you’re worried about inheritance, corporate, personal or capital gains taxes, establish residency in the Bahamas. Those taxes don’t exist there. The report says 20 nations in the Americas and Europe offer residency or citizenship programs now and more are considering it. The financial requirements vary widely – from a low of $200,000 in Dominica to $700,000 in Spain and Cyprus. Wealth-X’s data predict more of these ultra high-net-worth individuals will be looking for second homes with citizenship advantages. Right now, most who have a second citizenship through home-buying come from Pakistan, with Lebanon running a close second. The European Union has attracted the highest percent of second-citizenship applications with 56 percent. 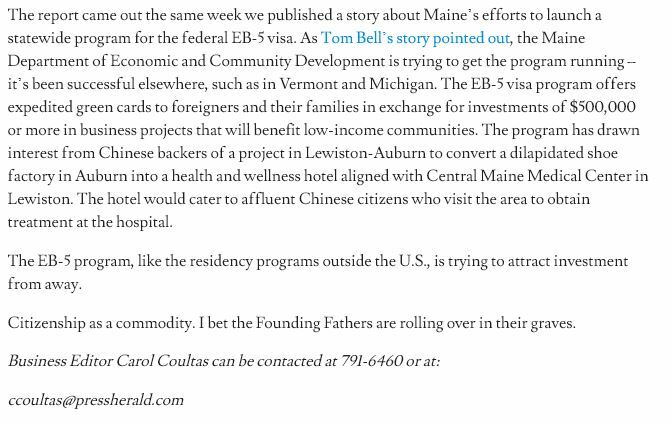 The report came out the same week we published a story about Maine’s efforts to launch a statewide program for the federal EB-5 visa. 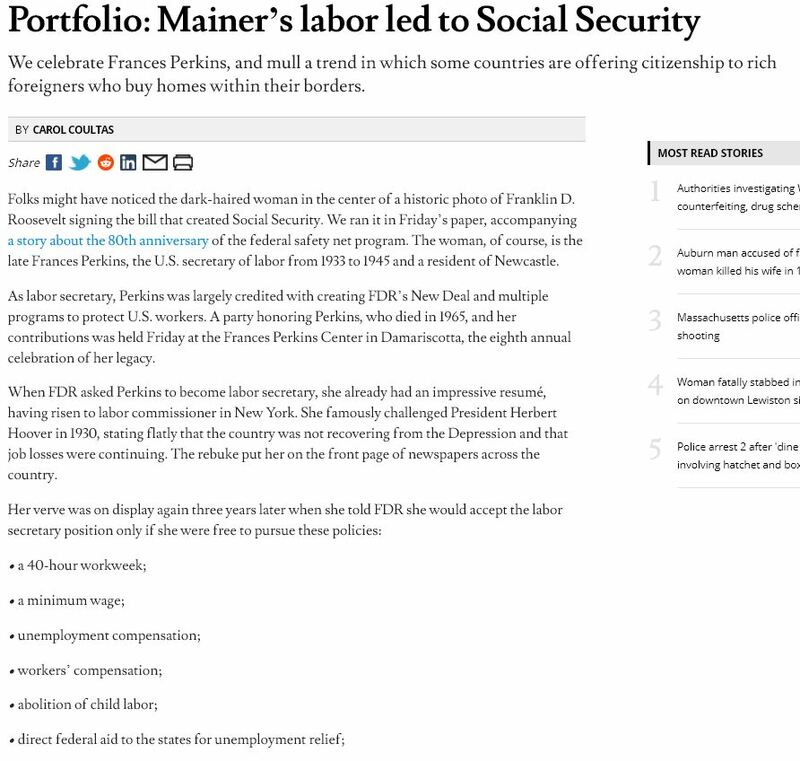 As Tom Bell’s story pointed out, the Maine Department of Economic and Community Development is trying to get the program running – it’s been successful elsewhere, such as in Vermont and Michigan. The EB-5 visa program offers expedited green cards to foreigners and their families in exchange for investments of $500,000 or more in business projects that will benefit low-income communities. The program has drawn interest from Chinese backers of a project in Lewiston-Auburn to convert a dilapidated shoe factory in Auburn into a health and wellness hotel aligned with Central Maine Medical Center in Lewiston. The hotel would cater to affluent Chinese citizens who visit the area to obtain treatment at the hospital. The EB-5 program, like the residency programs outside the U.S., is trying to attract investment from away. Citizenship as a commodity. I bet the Founding Fathers are rolling over in their graves.